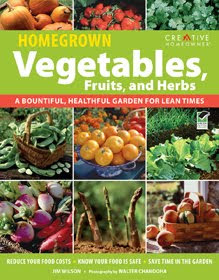 The question is what book will I recommend the next time someone tells me they would like to grow their own vegetables. Does everyone remember Jim Wilson from the Victory Garden South at Callaway Gardens in Pine Mountain, Georgia? Sure we do! I loved watching the PBS series, The Victory Garden, every Saturday back in the 1980’s (and before) and especially liked when they segued from Boston down to Georgia to see what Jim was growing. He was always growing something exciting, or at least it seemed exciting the way he talked about it. I loved how he walked around the gardens sampling all kinds of vegetables and raving about how good they were. I still remember him picking an ear of sweet corn, maybe in his garden or maybe in one of the many gardens he visited, cutting off a few kernels with his pocket knife and eating them right there. He probably said something like, “My goodness that is sweet. No butter needed for this corn. That is one sweet ear of corn”. It looked and sounded so good that I wanted to grow corn like that! Now with this book, it’s like Jim, and Walter, are walking us through the garden telling us once again how to grow our own produce. In an easy to read style, through words and pictures, they provide all the information you need to be successful growing your own vegetables, fruits, and herbs. As Jim noted at the beginning, he wants people to have success their first year growing vegetables, to avoid “the disappointment and downright failure that often comes with the first attempts at cultivating produce”. Jim knows, we all know, that if that first garden is a flop, many people will give up and never try again. So he and Walter came out of what he refers to as “blissful retirement” to write this book at a time when he felt we needed good, practical information about growing our own vegetables and fruits. Through this book, Jim Wilson, is teaching us in his own style how to be successful growing a vegetable garden. And Walter Chandoha is tempting us through his photographs to grow vegetables we swear we don’t even like, but decide we’ll grow them anyway, just because they look so good in those pictures. This is the book I’m going to recommend to anyone who tells me they finally want to grow their own vegetables and asks me how to get started. This is the book I’m going to pull off the shelf when I have a question about something I want to grow in my own vegetable garden. This is the book I’m going to read and enjoy whenever I feel a need for some gardening advice for myself. Thank you, Jim Wilson and Walter Chandoha, for coming out of retirement to collaborate on this wonderful book, Homegrown Vegetables, Fruits, and Herbs . Thanks for the review Carol! Gardening book reviews from bloggers I respect are so helpful in choosing which books make it onto my (growing) list of must-have gardening books. This one seems like one I'd like to add to my library. I never watched the TV show, but I think he wrote the Time Life books I got out of the library. I really need to plant veggies this year. I'm usually a fruit and flower girl, but I'm becoming more and more interested in the yummy veggies! This book could certainly help me! I do remember him from The Victory Garden. It sounds like a great book, and coming from you, veggie expert that you are, that's high praise. I love your book review. Very different from mine on the same book. In fact if you want to link, we can. Reading this book is like talking to a friend, which Jim is. And I think I will follow your advice and suggest the book to anyone wanting to grow a little of their food. It'll be hard to beat my battered and worn copies (yes, plural) of Barbara Damrosch's Garden Primer. But I respect your opinions and gardening wisdom, so it's on my shopping list for the next time I reach civilization. Carol, I like what I've seen of the book thus far. I think I'll find it very helpful. A seasoned gardener, I am always looking for something new to learn, and love to experiment with new plants, varieties and methods in the garden. Winning this book would save me from having to go purchase it...which means more seed money! It's hard to find gardening books that are <a href="http://www.start-growing-it.com/growing-blog.html>easy to read</a>. So thank you for your review. Most Gardeners are a little dry and boring when it comes to writing about gardening. Talking no problem. Writing is a bit trickier.